This July 2017 photo shows the 14.5-acre oceanfront estate belonging to the late billionaire philanthropist David Rockefeller on Maine’s Mount Desert Island. A real estate company confirmed Thursday, Feb. 8, 2018, that the property has been sold for $19 million, with proceeds going to fulfill bequests in Rockefeller's will. 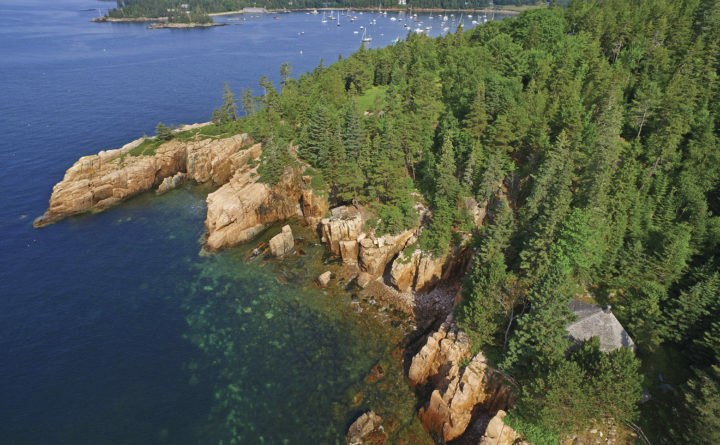 SEAL HARBOR, Maine — The summer home of the late billionaire philanthropist David Rockefeller Sr. on Mount Desert Island has sold for $19 million, with proceeds going to charity. The real estate company that handled the sale, The Knowles Co., declined on Thursday to identify the buyer, who paid the asking price. A limited-liability corporation assumed ownership at the closing on Feb. 2, Knowles spokeswoman Gina Platt said. Money from the sale will help to fulfill several bequests in Rockefeller’s will. Rockefeller, who was the son of philanthropist John D. Rockefeller Jr., died in his sleep in Pocantico Hills, New York, on March 20 at age 101. He left $20 million to the Land and Garden Preserve of Mount Desert Island in Seal Harbor and $5 million to the Maine Coast Heritage Trust. The property, called Ringing Point, sits on 14.5 acres (5.9 hectares) near Acadia National Park and includes towering forests, a granite pool and nearly a half-mile (0.8 kilometers) of rocky coastline. Rockefeller’s wife, Peggy Rockefeller, designed the seven-bedroom main house in 1972 and guided the landscaping. Rockefeller wrote his memoirs at a secluded study near the ocean. Rockefeller’s family has vacationed on Mount Desert Island for generations. His wife died in 1988.